You are currently browsing articles tagged crater. Above is the best (or the widest) shot I could get of Lake Manicouagan, which is the largest visible impact crater on Earth. Only three (or maybe four) are larger and none are visible. 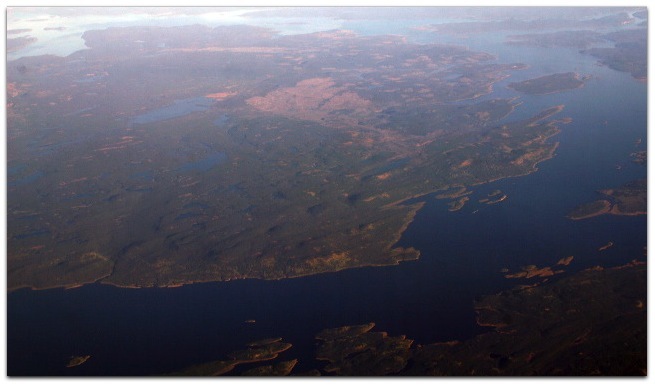 The Manicouagan impact event happened about 214 million years ago, give or take. That was 14 million years before the end of the Triassic, which was first of the three “dinosaur ages” of the Mesozoic, an era that came to an end with the Chicxulub impact. Coming that far in advance the Manicouagan event may not have been to blame for a mass extinction, but it wouldn’t have been pleasant. There are better photos in the series, but it was a hazy day and the one above does the best job of showing the crater’s edges. I’ve been wanting to see (and shoot) Manicouagan for many years, but routes and weather had never obliged before. This time they did, which was cool. For the form of life we call business, we are at a boundary between eras. For biological forms of life, the most recent of these is the K-T boundary between the Mesozoic and the Cenozoic Eras. The Mezozoic Era ended when Earth was struck by an object that left a crater 110 miles wide and a world-wide layer of iridium-rich crud. Below that layer lies the Age of Dinosaurs, completed. Above that layer accumulate the fossils of life forms that survived the change, and took advantage of it. Notable among these is a branch of theropod dinosaurs we call birds. In business we have the I-I boundary: the one between the Industrial and Information ages (which Alvin Toffler first observed in The Third Wave, published in 1980). Below that boundary we find a communications environment dominated by telecom and cablecom. Above it we find a radically different communications environment that still supports voice and video, but as just two among an endless variety of other applications. We call that environment the Internet. At this moment in history most of us know the Internet as a tertiary service of telephone and cable companies, which still make most of their money selling telephone service and cable TV. Since those are highly regulated businesses, the Internet is subject to degrees of regulatory capture. Some of that capture is legal, but much of it is conceptual, for example when we see the Internet as a grace of telecom and cablecom — rather than as something that subsumes and obsoletes both of those Industrial Age frames. That “broadband” comes to mean the full scope of the Internet’s capabilities, and not just data speeds. That we develop a native understanding of what the Internet really is, including the realization that what we know of it today is just an early iteration. That telecom and cablecom companies not only see the writing on the wall for their old business models, but embrace other advantages of incumbency, including countless new uses and businesses that can flourish in an environment of wide-open and minimally encumbered connectivity — which they have a privileged ability to facilitate. That the Net’s capacities are not only those provided from the inside out by “backbone” and other big “carriers”, but from the outside in by individuals, small and mid-size businesses (including other Internet service providers, such as WISPs) and municipalities. That last item is important because carriers are the theropods of our time. To survive, and thrive, they need to adapt. The hardest challenge for them is to recognize that the money they leave on the shrinking Industrial Age table is peanuts next to the money that will appear on the Information Age table they are in a privileged position to help build.